Hopefully you’re not home reading our blog with thermometer in mouth, feet soaking in hot water, lemon tea brewing on the stove, fighting off the nasty bug that you or your kids picked up at work or school – but it is indeed winter, the time of year when so many of us suffer the miserable effects of the common cold or flu. 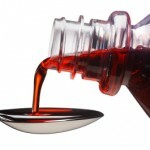 Naturally, the use of a variety of non-prescription pain-relievers, fever-reducers, and cough/cold remedies goes up dramatically during the cold season, so it shouldn’t surprise you that the number of accidental poisonings and adverse drug reactions to these products does as well, especially among children. 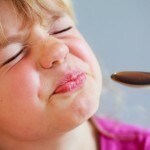 In 2009, the American Association of Poison Control Centers (AAPCC) reported a whopping total of 88,355 cases in the US involving cough and cold medications (CCMs); 46% involving children younger than 5 years old. In an effort to reduce the incidence of poisonings and adverse reactions to CCMs in children, major drug manufacturers issued a voluntary recall of CCMs labeled or intended for children younger than 2 years of age in October 2007. One year later, the recall was updated to include medications labeled or intended for children younger than 4 years of age to further improve medication safety. So how are we adjusting to these new, more restrictive labeling recommendations? Especially with the urge to reach for a quick remedy in an effort to make our little ones with coughs, high fevers, and runny noses feel just a little bit better? Liquid CCMs are often sweet, fruit-flavored, and brightly colored. 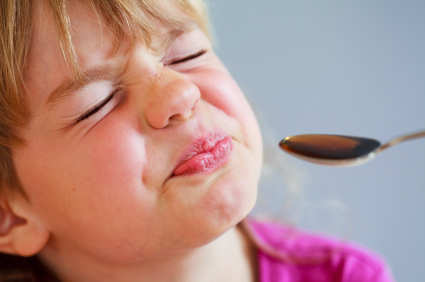 Never call medicine “candy” or “juice” to prevent confusion by children. Read all product directions carefully, and make handwritten instructions available to all caregivers. 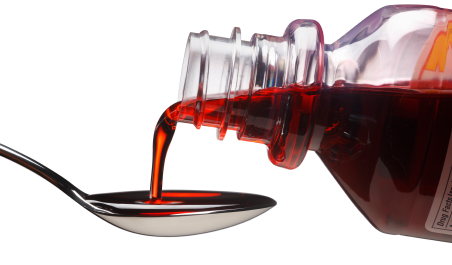 Use a medication spoon or syringe for accurate dosing. Remember that products labeled for “infants” are not interchangeable with products labeled for “children.” If you have any doubts about dosing instructions, call your pharmacist or pediatrician. Match the correct product with the correct symptoms. When in doubt, ask a pharmacist or your pediatrician. Avoid dosing medications out of habit. Since labeling of CCMs changes periodically, read directions each time product is purchased. Antibiotics are ineffective in treatment of viral illnesses such as the flu or common cold. CCM products may contain a single ingredient or a combination of active ingredients including analgesics, expectorants, cough suppressants, decongestants, and/or antihistamines. Depending on the active ingredient, overdose or overuse of these pharmaceuticals may cause mild to moderate symptoms ranging from grogginess, irritability, restlessness, increased heart rate, and dry mouth/skin, or more serious complications such as agitation, hallucinations, seizures, irregular heartbeat, high blood pressure, and coma. The staff at the IPC follows specific guidelines for when it is safe to observe a child at home or when referral to a hospital emergency room is necessary. Remember, just because a product is sold over-the-counter does not mean it is non-toxic. All medications are potentially harmful when label instructions are ignored or misunderstood. Feel free to call the IPC at (800) 222-1222 any time you suspect an overdose or therapeutic error involving a CCM or any other prescription or non-prescription medication. As always, remember the importance of getting your yearly flu shot, and washing your hands frequently – the best way to deal with an illness is to prevent it outright. But if you find yourself feeling under the weather this winter, a big bowl of mom’s chicken soup is sure to make you feel better – we suggest adding 1 to 2 splashes of spicy-hot Tabasco™ sauce to open everything up –but at your own risk!